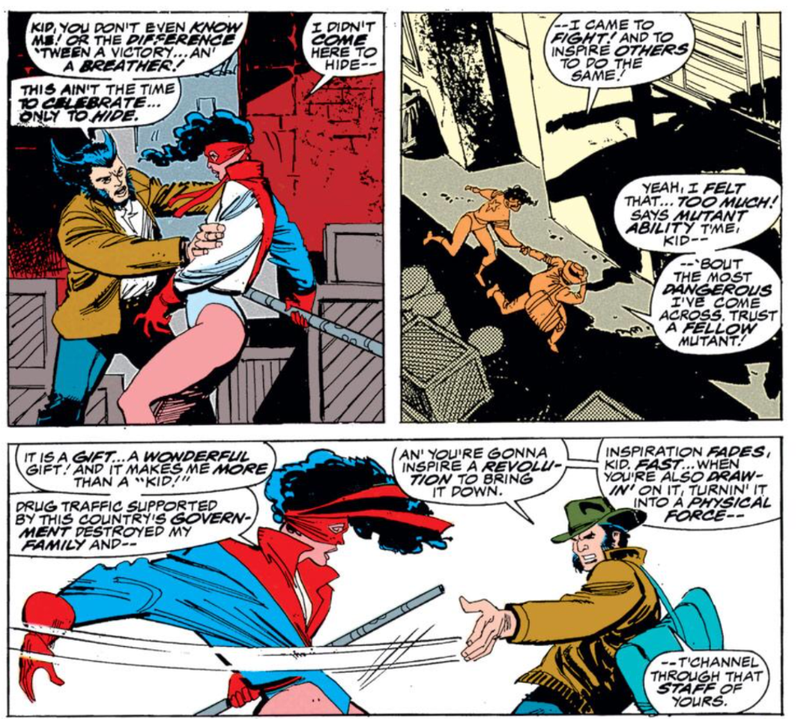 Afterwards, Wolverine sneaks into Caridad's estate and ambushes Geist demanding to see Roughhouse, while Caridad urges his wife to use her healing abilities on Roughhouse, threatening their son if she doesn't. Just then, La Bandera attacks the complex as Geist leads Wolverine to the medical center. Inside the center, Wolverine is attacked by Tiger Shark, who knocks him into one of the pipes exchanging seawater for the complex's filtration system. Wolverine manages to escape out into the ocean, but as he swims for the surface, he's grabbed by Tiger Shark. This issue and the next comprise Wolverine's contribution to "Acts of Vengeance", as Wolverine battles Tiger Shark, principally a Sub-Mariner villain who's also battled the Avengers on occasion (he was part of the iteration of the Masters of Evil which sacked Avengers Mansion), though his role in this story has nothing to do with the larger "Acts", as he was simply hired by the Kingpin to kill La Bandera, who had caused some trouble with Kingpin's Miami operations before fleeing to Tierra Verde. La Bandera, then, appears for the first time in this issue. A young mutant with the ability to amplify the emotions of people around her (usually their sense of patriotism) and then channel that emotional energy through her staff, this storyline is pretty much the only notable appearance of the character (I think she pops up in a later issue of Captain America, but that's it). 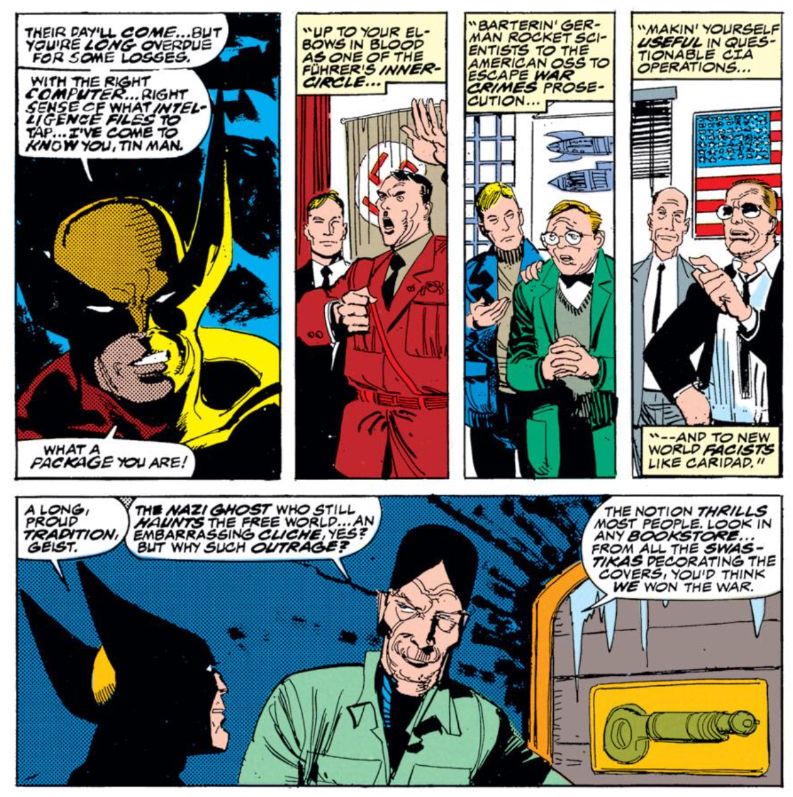 We meet another old friend of Wolverine's in this issue, one whom we've never heard of before nor will ever hear from again after this story, CIA agent Jack Bascomb. 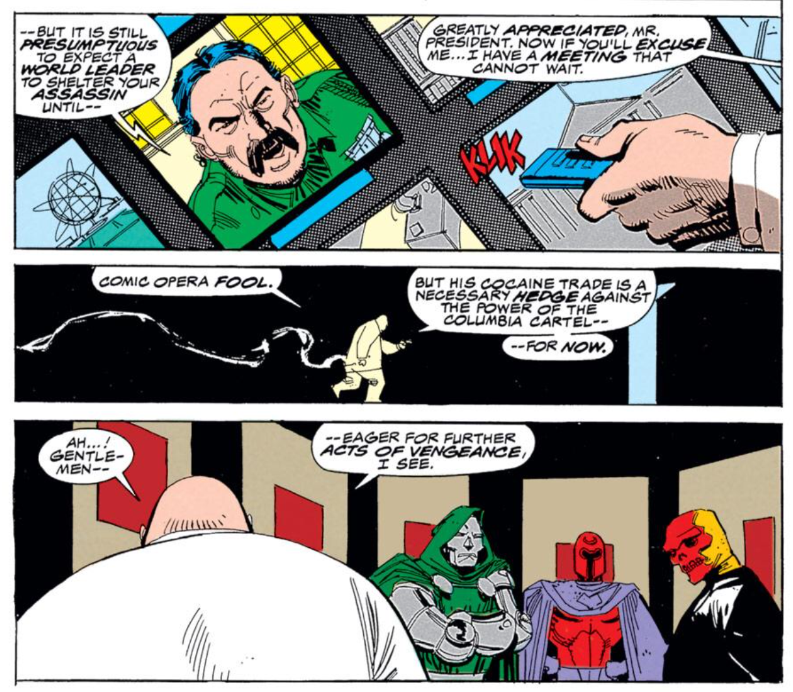 The Prime Movers do appear in this issue, via a silent panel as Kingpin talks with Caridad. Between last issue and this one, Wolverine appeared in Uncanny X-Men #246 (when he tells Storm he needs some time off, just before their battle with Master Mold). This issue establishes that Gateway delivered Wolverine to Puerto Verde. Geist's past role as Hitler's right-hand man is revealed this issue. It's impressive how seamlessly Goodwin & Byrne work an "Acts of Vengeance" tie-in into their ongoing story. 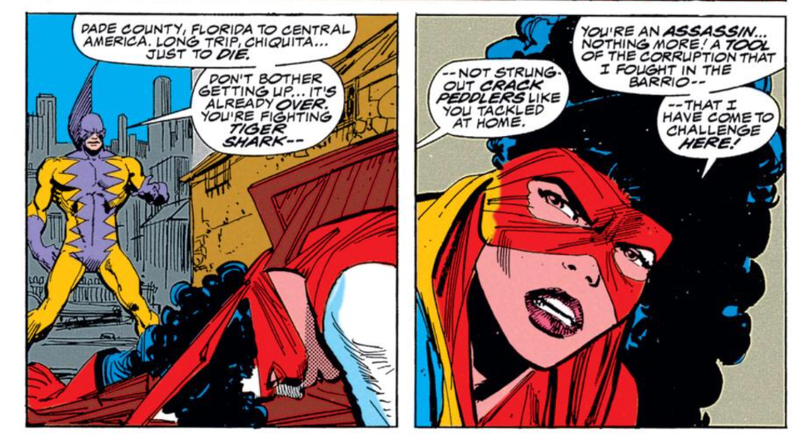 Revealing a connection between Caridad and Kingpin makes sense even without "Acts" (given the drug connection and the Daredevil references in the previous two chapters, Kingpin showing up at some point was probably inevitable anyway), and Tiger Shark is a clever choice to use as a foil for Wolverine. 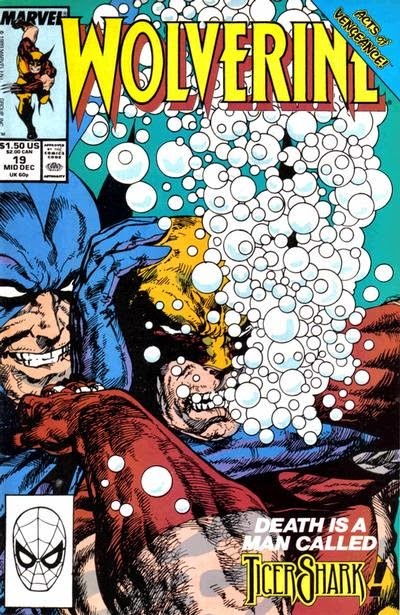 Not because the villain is terribly notable or cleverly designed, but because his connection to water makes him a slightly more formidably foe for Wolverine than the usual antagonists, given that drowning is one of the few ways Wolverine could actually die. Not that the star of any comic book series is ever in any legitimate danger of dying, but having Wolverine fight a villain who actually could kill him injects a bit more suspense than usual into the storyline. It's a smart way to use a larger crossover narrative to the series' advantage (though of course, this has nothing to do with the larger "Acts" storyline and anyone checking out this issue because of it was probably confused as they landed smack dab in the middle of an ongoing storyline, but hey, that's "Acts" problem and not Wolverine's). Next week, Uncanny X-Men #257, New Mutants #85 and X-Factor #50. "this storyline is pretty much the only notable appearance of the character"
Too bad nobody remembers her, she'd have been great cannon fodder for when a writer needs to prop up how SERIOUS his story/threat-in-the-story is. "A young mutant with the ability to amplify the emotions of people around her (usually their sense of patriotism) and then channel that emotional energy through her staff"
Wow, that's almost as unnecessarily complicated as Lorna's new "amplifying negative emotions in people so can just absorb them to make herself stronger". I guess they didn't want her to just have a generic "shoots energy blasts via her staff" power, but still. It's too bad Goodwin/Byrne/Janson only did one story, the probably could've made a good long-term team on this title. Maybe it's just me, but I think Janson's inks actually look pretty cool on Byrne's artwork. It's still recognizably Byrne, but I like the sketchiness as a kind of change of pace for him. Quite an apt power for a young idealist like herself, and a nice deviation from your regular Captain Cuba sort of hero. Of course, so that she doesn't just get everyone who rallies behind her bandera killed, she needs to have that aggressive blasting power too. Very organic sort of power setup. This issue really screws up the timeline of Acts of Vengeance. Here's why- this issue features the Red Skull. The Red Skull only joins the cabal after Hydrobase is sunk, as shown in Captain America 365. 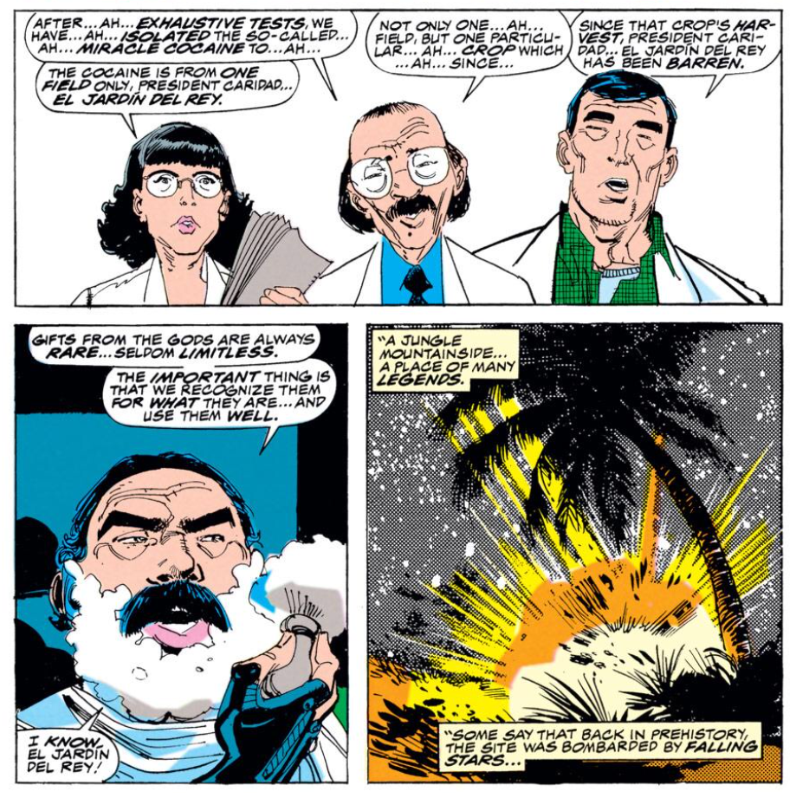 Avengers West Coast 53 takes place at roughly the same time as the sinking of Hydrobase. At the end of Avengers West Coast 53, Iron Man and Wonder Man go searching for the U-Foes. Avengers 312 takes place after Uncanny X-Men 255. Avengers West Coast 54 takes place after Avengers 312 and it opens with Iron Man and Wonder Man still searching for the U-Foes. So while Iron Man and Wonder Man were searching for the U-Foes, Logan got into a fight with Tiger Shark, fled with Roughhouse and Sister Salvation into the jungle, got captured and tortured, helped Salvation defeat Spore, went back to Madripoor, captured Coy and the Prince and gave them a scare, went to Australia, got captured by the Reavers and tortured, was nursed back to health by Jubilee and escaped the Outback Base, damaging several of the Reavers in the process. Then Pierce repaired the Reavers, they attacked Muir Island, got into a fight with Freedom Force in which Avalanche was injured, Freedom Force returned to the United States and Avalanche recovered enough to fight the Avengers. So how long were Simon and Tony looking for the U-Foes? I can't fathom that a hot shave during which a trio of scientists tell me the results of their research would be an effective balm for a migraine. Per the cover, "Death Is a Man Called Tiger Shark! "; I believe Thanos would disagree. I couldn't speak to all the details Anonymous threw out above on the Acts of Vengeance timeline, but it did occur to me that this storyline in Tierra Verde is basically an extended flashback in terms of Uncanny's present yet we have the crossover rearing up both there, with Psylocke, and here in Wolverine during the same month(s) of publication. Here's me hoping someone would entice Joss Whedon into a drunken bet and as a consequence in the upcoming INFINITY WAR (or whatever's the name is) movie Thanos, in order to please the man called Tiger Shark, would turn half the population of universe into sharks, because the balance between sharks and non-sharks has been disturbed. I hope they'll get Ian Ziering for the role of Todd Arliss. It's not like they shouldn't be hastily taking any excuse to bring in Namor the Sub-Mariner into MCU anyway, seeing that over at the Distinguished Competitor the Aquaman is apparently going to be the hottest property. Other than that, I find it hard to downright blame the Marvel and their marketing department for doing the event simultaneously on all titles, rather than three months later on one title when it would chronologically fit better. "So, kids, remember how the villains pooled up a while back, and --"
wwk5d -- "Too bad nobody remembers her, she'd have been great cannon fodder for when a writer needs to prop up how SERIOUS his story/threat-in-the-story is." Mark Gruenwald already did it. He killed her off-panel in his second-to-last issue of CAPTAIN AMERICA. A serial killer was hunting superhumans in South America and took her out. See 1995's CAP #442. I'll take your word for it, since while a good chunk of Gruenwald's CA was mighty fine reading, from what I heard, the last year or so was...rough. Depends on how you read it. Granted, it's been a while now, but I re-read Gruenwald's full CAP run in maybe 2008 or '09. While I won't say the end is nearly as good as the beginning and middle, it has its moments. And I've said for years, and continue to maintain, that I don't believe "battle armor Cap" was done in earnest. I really think it was Gruenwald's meta-commentary on "EXTREME" nineties comics. As for Bandera, I'm not sure anyone besides me ever actually read that issue. 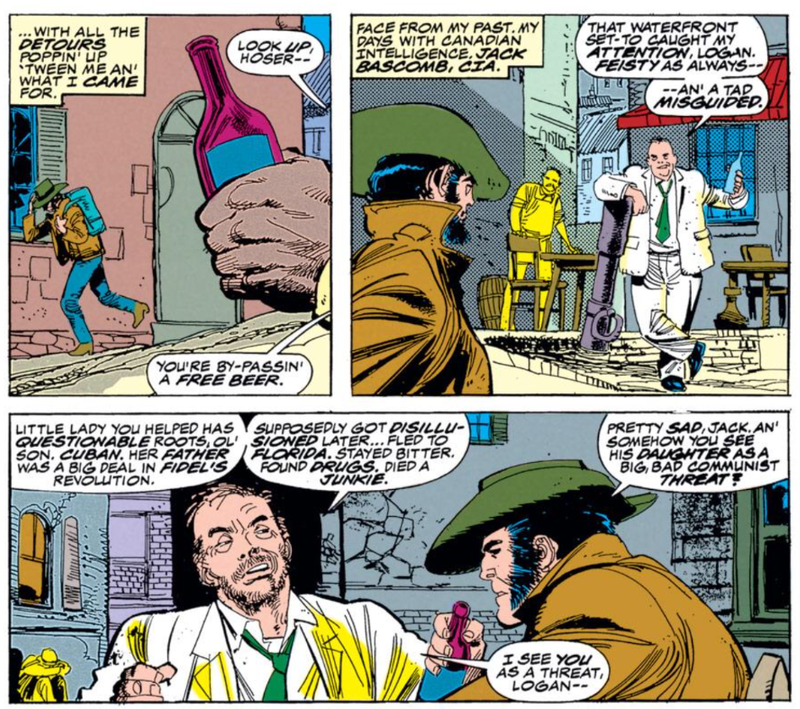 Another of the deceased was listed as Batroc's brigadier, Machete, but he was back in action in short order. The discrepancy was later fixed by saying that the new Machete was the original's brother. And then that Machete died and the character later showed up alive and well, which led to another ret-con involving a third brother. Is Machete really so beloved a character that he can't stay dead?? Sorry, got sidetracked there. Anyway -- I'm sure it would be a piece of cake for someone to bring Bandera back since her death was only mentioned and never seen. Agreed. I'm really enjoying this one, so far. It's the most "traditionally comic book-y" story for the series yet. @Jeff: Maybe it's just me, but I think Janson's inks actually look pretty cool on Byrne's artwork. I do too. I tend to dislike Byrne with sketchier inkers, but I'm really digging the look here. It's Byrne, but it also fits the established look of the series. @Teemu: Of course, so that she doesn't just get everyone who rallies behind her bandera killed, she needs to have that aggressive blasting power too. Very organic sort of power setup. Well said. I hadn't thought of it in those terms, but it makes the power blast seem a little less extraneous. @Anonymous: This issue really screws up the timeline of Acts of Vengeance. Yikes, you're not kidding. I'd never put all that together before, but that's a pretty terrible bit of chronology. Even worse than the New Mutants returning from Asgard, then getting caught up in "Atlantis Attacks". @Blam: I can't fathom that a hot shave during which a trio of scientists tell me the results of their research would be an effective balm for a migraine. @Matt: He killed her off-panel in his second-to-last issue of CAPTAIN AMERICA. A serial killer was hunting superhumans in South America and took her out. See 1995's CAP #442. Is Machete really so beloved a character that he can't stay dead?? It could be a Captain Marvel sort of trademark thing going on with Machete, you'll need one running around every now and then to keep a claim on the name. Byrne sure likes drawing Hitler, swastikas and the whole setup. At the end of his FF Nick Fury went and tried kill him, now Wolverine meets an old Nazi and soon enough Namor will return on his own title and go against a Nazi villain Ubermensch. Gives very ironic tint on Geist's notion about what sort of books sell. @Teemu: Byrne sure likes drawing Hitler, swastikas and the whole setup. It helps that Nazis just make for good, unambiguous villains (when a story calls for such a thing, which with comics, is often). Which is another reasons why it was so frustrating that Captain America punched zero Nazis in his WWII-era film. Noooo! It's really not that bad, I swear. Read in one sitting (or a few chunks, as opposed to monthly) and skipping over the pointless Archangel fill-in, it's not a bad little story. Not an all time great or anything, but also not so bad you need to avoid it like the plague. Teebore: It helps that Nazis just make for good, unambiguous villains (when a story calls for such a thing, which with comics, is often). Personally I think it's the uniforms. When you openly don on black with a skull emblem, you're as close to a comic book villain as you can get. It's like... if you take the classic yellow-on-green Hydra look and think of amping up the evil chic on it you're only going to end up with an impotent rage, because the obvious "black & more skulls" approach is only taking you back to beyond square one. Like. On AGENTS OF SHIELD they have the old Hydra looks of Whitehall and gang with a genuine SS uniform with a Hydra emblem on the cap. Someone on the costume tryouts was probably saying the skull emblem could perhaps be more skull-y, and then what you got was lots of frustrated arm-spreading. Or maybe I have had my cause and effect all mixed up here, but I can't help but thinking that the world lost a great comic book artist in Hugo Boss. @Teemu: When you openly don on black with a skull emblem, you're as close to a comic book villain as you can get. I can't help but thinking that the world lost a great comic book artist in Hugo Boss. Or, y'know, The Punisher. Although personally I think that proves your point. Blam: Or, y'know, The Punisher. Although personally I think that proves your point. Ah, that obscure 70's Spidey villain slipped my mind. As they say, you either die as a villain or live long enough to see yourself become the 90's superhero. Amazing Spider-Man #129 was among my first comics. The Punisher had not just a huge skull insignia on his bodysuit but a severe widow's peak (long since gone) and guns (still very much around), which I properly read as "bad guy"; he was hired by The Jackal to kill Spidey, and even though Spidey had been framed for murder — even though The Punisher said he only killed people who deserved killing — that was not superhero stuff, at least to me at all of three years old. While he may well have worked as the protagonist of his own stories from a particular point of view, I just can't accept Frank Castle teaming up with the good guys of the Marvel Universe I grew up reading. But, Blam, I take it that HEARTS OF DARKNESS, featuring the Punisher, Wolverine and Dan Ketch Ghost Rider didn't tickle your fancy then? There's something about Blackheart's in-story commentary over these borderline heroes willing and capable to "go there" that could be seen as a KINGDOM COME type of deconstructional send-up of the 90's comics, though in all probabliness Marvel just did do that in all earnestness. Over this side of water we were usually about two years behind with the publications, but with HEARTS OF DARKNESS they put it through just in the heels of the American schedule explicitly as a some sort of special treat. Which is... a thing, I guess. Actually... after searching my soul a bit, I have to say that I was out of my place over Dolph Lundgren, who is a man very much in his place in his film catalogue and to own up that I do have considerable affinity towards early 90's Punisher and his A.W.E.S.O.M.-O plots: In order to take down drug pusher's mobile fortress, Frank Castle has to apply undercover for to be their motorcycle runner. Starring Adam Sandler. And as a special guest star, Nicholas Gage as Ghost Rider. It's hard to believe how little I'm kidding.